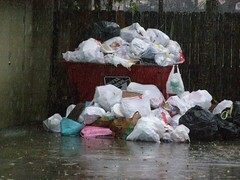 Last month, I watched as Veronica White announced on Geektv that the City of New Orleans would conduct a survey on recycling needs for a month but through various communications today we noticed that the information is just reaching the ground this week. I emailed Veronica White about this and asked her to consider extending the survey if her data confirmed the need. She reponded immediately and said her department will accept responses for another month. The news is circulating via the Times Picayune and announcements on WWNO. Editor B. put the link on his site on the 14th so really, it’s just getting around now after a few weeks of her announcing it. I was excited when I saw it on Geektv but I thought everyone watched Geektv and I thought it wasn’t even newsworthy because I try not to be too repetitive here. I was wrong. The news of the survey is just now gaining momentum. So pass it on! 1) Call the 311 number to do the survey over the phone. Fast. 2) Send it in via snail mail from the T-P.
3) Print it from this Recycling Survey and mail it in via snail mail. I had hoped you could fill it in electronically, but, I guess not. Maybe they feel that would skew the stats. 4) A survey will appear in your S&WB bill this month too. So there you go, “‘Tell me what you want, what’cha really, really want!” ala Veronica White! The phone number doesn’t work. It is a dead line. I just tried it, it’s the City’s info line and it seems fine. I just spent 1/2 hour signing up and still don’t see the survey, what’s up with that?